You've invested your hard earned money in an estate or home with surrounding landscape, trees, and maybe a guest house or two. Your sanctuary, your hide-away, your home. You have an alarm system with video coverage and an alarm company ready to respond if anyone threatens your property or your safety. Your staff is in place to assist you in anyway you need. Now you can also have an automatic wildfire protection system installed to help protect you and your estate from wildfire. Until now, you've depended soley on the response of the local fire department. But the fire department is telling you it's your responsibility to protect your own property. That's where we can help. Whether you're there or not, 24/7. 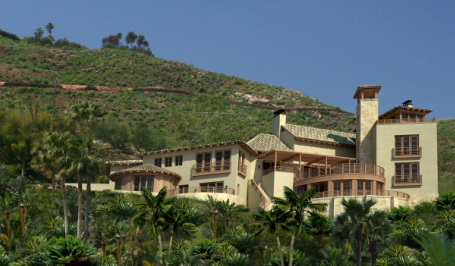 Our wildfire protection systems will keep you and your property safe. We also have additional accessories and services to assist you. Call us at 1-866-901-CFPI (2374) and let us assist as your own private wildfire protection company. The FOAMSAFE FireMaster™ System is an automatic wildfire protection system that activates automatically when its fire sensors see a wildfire approaching from up to 1/2 mile away. It blankets a property with a safe, biodegradable foam that stops a fire in its tracks and prevents flying embers from starting spot fires on your property. It is available in three suggested levels of operation for your wildfire protection needs. The models below are suggested systems and can be customized to fit your specific property needs. The FireMaster System is designed to give you the protection you desire. Standard packages are available for what ever level of protection you need. Additionally, custom installation options are available to provide you with the specific wildfire protection for your property. Our expert staff can help you choose the system that is right for you. If you have a water source, such as a pool, pond, river, lake or other reservoir, it will be used as a necessary water source for the system. In addition, if solar or other alternate power is available, it may be used as a required independent source of power for your wildfire protection system. We never use community provided utilities as a source of power or water for fire protection. The FOAMSAFE™ System is completely self-contained. All fully automatic systems also have manual controls including a touch screen, allowing you to turn the system on or off. You can override the automatic system operation at any time. We also provide in-house monitoring services 24/7 so you can have peace of mind knowing we are monitoring for any wildfires that may threaten your property. If a wildfire happens in your region, our Private Wildfire Response Teams will patrol the area during the fire and be available for support if needed. Our staff of wildfire protection specialists are available to help you choose a system that suits your fire protection needs. Whether you own a business, resort, estate, ranch or home, each system can be custom designed to help protect your property from wildfire. 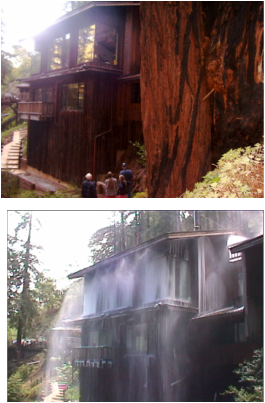 If you reside in the Wildland/Urban Interface (WUI) areas, you can’t afford to live without a FOAMSAFE™ System. Please visit our Testimonials page for more customer comments. FOAMSAFE™ Elite System - The ultimate exterior FireMaster System distributed by CFPI. Have complete control and/or add monitoring services offered by our fire professionals including standard notifications that your system has been checked and all components are working; ready to help protect your property from fire. In addition, you can have access to the same monitoring programs viewed by our technicians. This is truly a top-of-the-line, worry free system! FOAMSAFE™ Manual System - Suitable for those who choose to pre-treat their property by hand prior to evacuation. 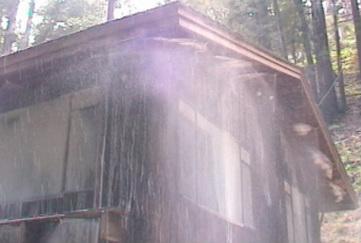 This system can also be used to extinguish a fire inside or outside a structure. Call 1-866-901-CFPI (2374) for pricing or contact us HERE for further information.